(New York) – The death of Chea Sim, a former Khmer Rouge official and longtime president of the ruling Cambodian People’s Party (CPP), should spur renewed efforts to bring remaining Khmer Rouge leaders and others most responsible for Khmer Rouge crimes to justice, Human Rights Watch said today. Chea Sim, who oversaw districts where numerous atrocities occurred and then presided over a police state after the Khmer Rouge was ejected from power, died on June 8, 2015, in Phnom Penh. Chea Sim was among the many former officials of the Khmer Rouge who have never been investigated for serious international crimes, including possible charges of genocide and other crimes against humanity, committed during the Khmer Rouge regime from 1975-1979. Research conducted for Human Rights Watch in 2005 found evidence that Chea Sim was implicated in serious crimes in his capacities as secretary of the Khmer Rouge Party Committee for Ponhea Krek District of East Zone Sector 20 and as a member of that Committee from 1975-1978. 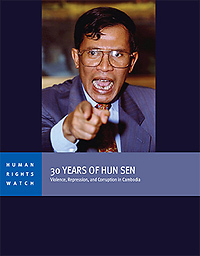 These include the arbitrary arrest, torture, and execution of 1) former Khmer Republic officials targeted on political grounds; 2) members of Cambodia’s prerevolutionary upper classes targeted on sociopolitical grounds; 3) fellow Khmer Rouge accused of political dissent; and 4) members of the Vietnamese, Cham, and Chinese ethnic groups targeted on racial, ethnic, national, and religious grounds. Chea Sim, like other Khmer Rouge district party secretaries, oversaw a district security office and exercised authority over commune militia forces that directly committed torture and execution of people who were arrested on these various grounds and held without charge or trial. As a district party secretary and member of the higher-level sector committee, Chea Sim was implicated in the alleged enslavement of the population in these areas of the Khmer Rouge East Zone. This and other evidence against Chea Sim was presented to the United Nations-supported Extraordinary Chambers in the Courts of Cambodia (ECCC), the tribunal created in 2006 to bring to justice “senior leaders” and others “most responsible” for Khmer Rouge crimes from 1975-1979. However, the evidence was not seriously pursued because of the political control exercised over the court by Prime Minister Hun Sen, himself a former Khmer Rouge member, and t he CPP, in which many former Khmer Rouge play significant roles, especially in the armed forces and local administration. This same political interference continues to stymie prosecution of other former Khmer Rouge who held positions of responsibility similar to Chea Sim from 1975-1979. After the Khmer Rouge government was overthrown in January 1979 by a Vietnamese invasion, Chea Sim was named minister of interior in the newly installed Cambodian government. He held this post through 1981 and in this capacity helped oversee the creation of new security forces, including police and intelligence units, and the establishment of new prisons throughout Cambodia. The objective of this new system was to repress all opposition to the new government, including armed insurgencies, nonviolent opposition groups, and individuals engaging in peaceful dissent. Arrests on political grounds were routinely carried out, detention was almost always without charge or trial, and prisoners were often held indefinitely on the basis of unsubstantiated or false allegations. Confessions were frequently obtained through torture. Torture was facilitated by holding prisoners incommunicado while undergoing interrogation, completely isolated from the outside world and even from fellow inmates, and often in “dark cells.” After officially leaving his post as minister of interior, Chea Sim remained among the most important officials in Cambodia for the next decade, identified by ruling party colleagues as the most powerful leader of the faction of the party in charge of internal security, the police, and prisons. As minister of interior, Chea Sim also helped to protect and place fellow former Khmer Rouge into positions of authority in his ministry, the security forces, and the local administration. This was part of a process of protecting those responsible for Khmer Rouge crimes from scrutiny, which Chea Sim himself enjoyed and embodied.